Upcoming November Paint and Sip Events! Have you checked out our November calendar yet? We’ve got a lot of fun deals for you! Looking to kick back and relax for a few hours over Thanksgiving break? We’ve got you covered! Thanksgiving Break Open Studio is Wednesday, November 21st from 11am to 3pm. Every Wednesdays, is Wine Wednesday here at Pinot’s Palette Glenview! Book an evening class (7-9pm) and purchase wine bottles from our bar for 25% off! Can’t make it on Wednesdays? We celebrate Thirsty Thursdays on some Thursday’s too! Where you can get glasses of wine for just $5! If you’re thinking of having a night out with the people you love, we have both Date Nights and Ladies Nights! For Date Night, we’ll be teaching paintings that come in pairs – perfect for you and your significant other or you and your best friend! Are you thinking of bringing out a whole group of gal pals for a fun night? Come with your girlfriends on select Thursday’s for just $32 per seat! Family Fun days have been a hit in recent months! Come to our Family Fun days for only $30 per seat. Have you seen our recent wood paintings? They’ve been so fun to paint, that we’ve got two more on the calendar in upcoming weeks! On the day before Thanksgiving, (Wednesday, November 21) we will have the option to paint on wood OR canvas for our patched up snowman painting! 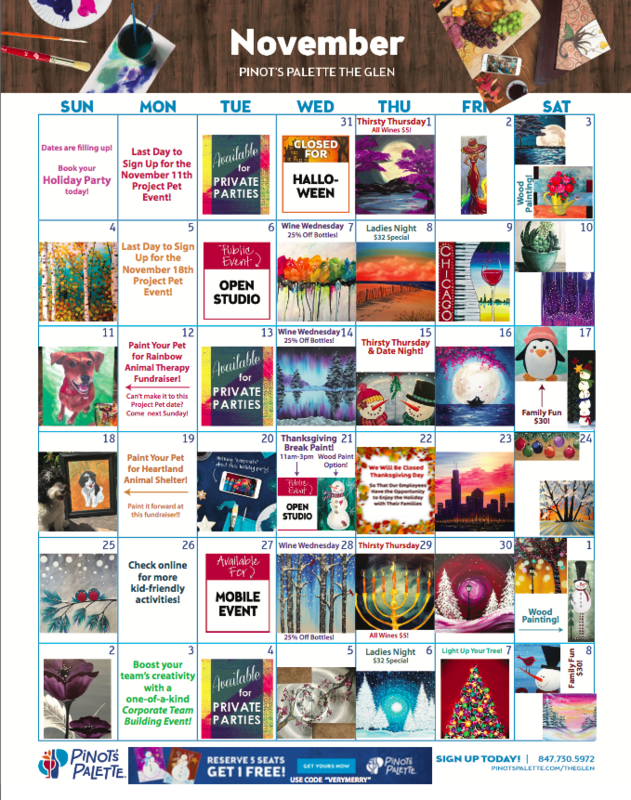 Check our online calendar to see the rest of the awesome paintings we have scheduled for this November!